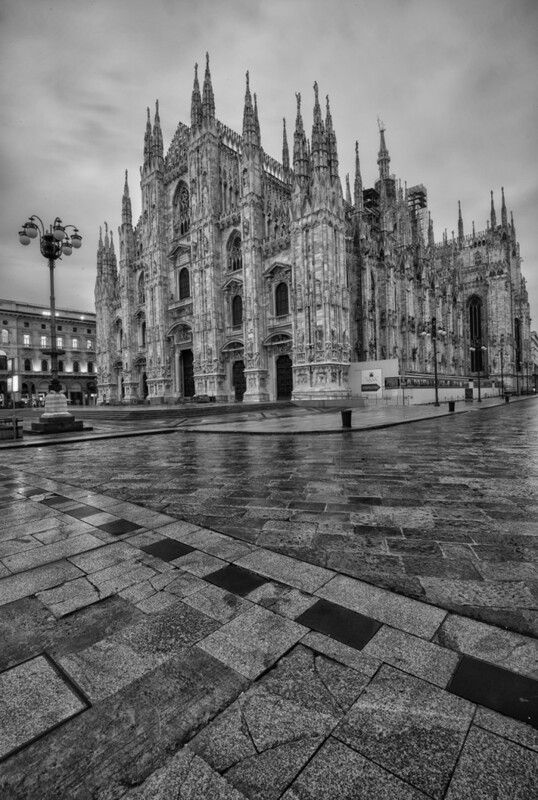 Before my working day began this morning, I awoke early, at 6.00am, and headed out from my hotel towards the famous “Il Duomo”, Milan’s great cathedral. Splashing through the rain-splattered streets, I found the walk unpleasant. Not just because Milanese drivers give no quarter to even a solitary morning walker but also because so many of the buildings were daubed with graffiti – an Italian invention, after all. 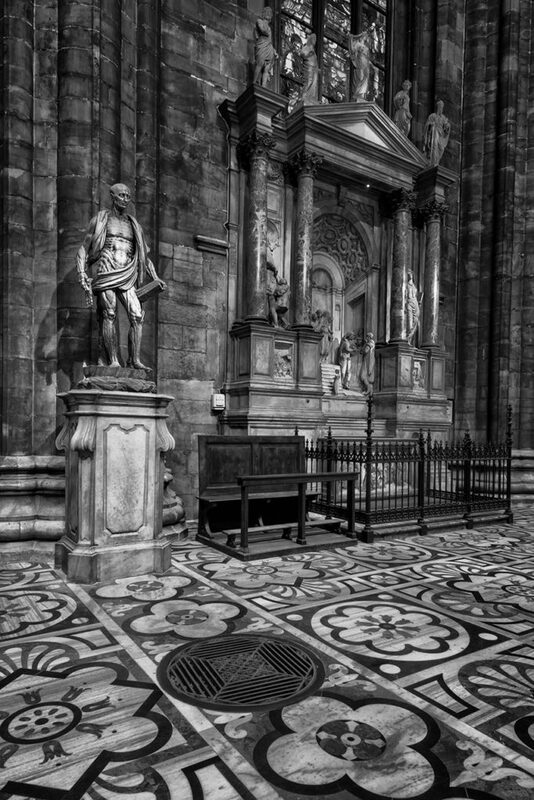 Arriving on the square in front of Il Duomo, I stopped and stared at the sheer majesty of the great church’s Gothic architecture. Six hundred years in the making, I had the immediate impression that not a single day had been wasted. I walked to the far side of the piazza in front of Il Duomo, intending to photograph her from an oblique angle, only to be accosted by a huge, 20ft high by 60ft wide LCD screen, built right into the side of the cathedral wall, advertising the unholy attractions of Korea’s greatest mobile phone. Maybe if I used one, I could call God. Maybe he would answer. Once inside, I was struck by how many people were already there. Although there was no religious service under way, already there were a couple of hundred people praying, lighting candles, going through the reassuring rituals of organized religious belief at 7.00am on a rainy weekday morning. And these were not just the elderly women one finds in early-morning churches the world over, though, God knows, there were plenty of them, but also thirty-something businessmen on their way to the office, maybe praying for divine deliverance of a long-overdue promotion, and teenage student girls, perhaps hoping to achieve an undeserved elevation in grades that they had left too late to earn through dutiful study but hoped to inveigle through divine intervention. 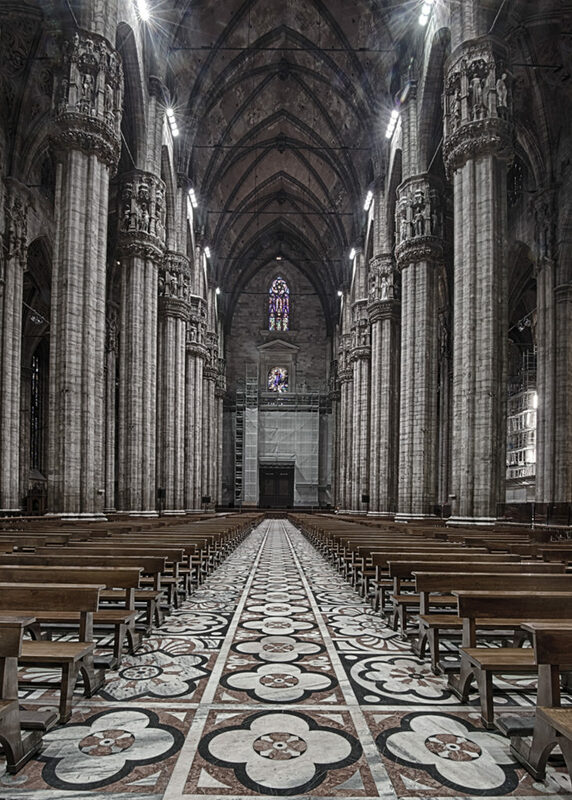 Milan’s great cathedral caters to the spiritual needs of all her disparate citizens. There are many kinds of blocks to creativity: some mental, some emotional, others simply practical. Sometimes, it’s a lack of energy, the absence of inspiration or just plain cowardice: the fear of trying to create something artistically worthwhile and failing. Sometimes, the mind is so occupied with other thoughts that it becomes impossible to focus sufficiently to recognize a scene that is worth photographing, let alone to take the photograph itself. Under such circumstances, I have gotten into the habit of challenging myself to photograph a subject that I know will be particularly difficult. Choosing an easy subject – a pretty flower, a scenic landscape – would be the easy way out: I could take a decent photograph and immediately despise myself for having stayed within my comfort zone, for having chosen the easy way out. By contrast, if I can overcome a challenging subject, then maybe I can start to believe again that I can be a creative photographer. 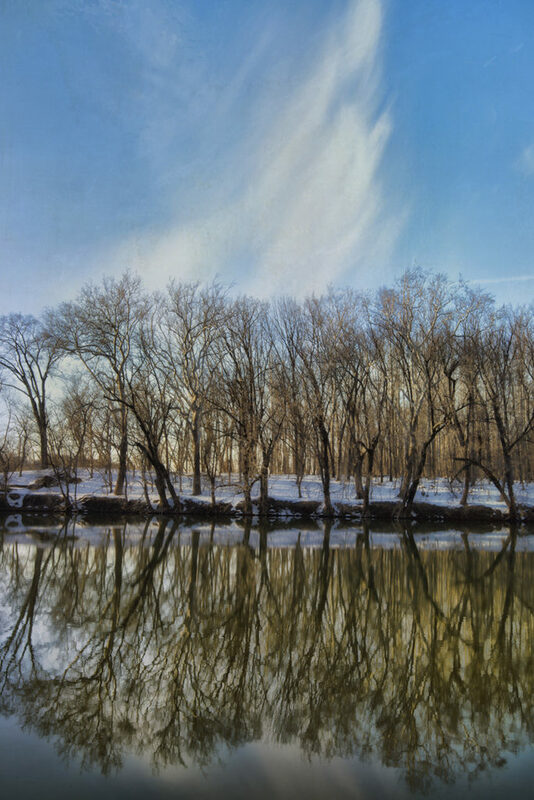 One such favourite subject of mine on days like this is the Monocacy Aqueduct. 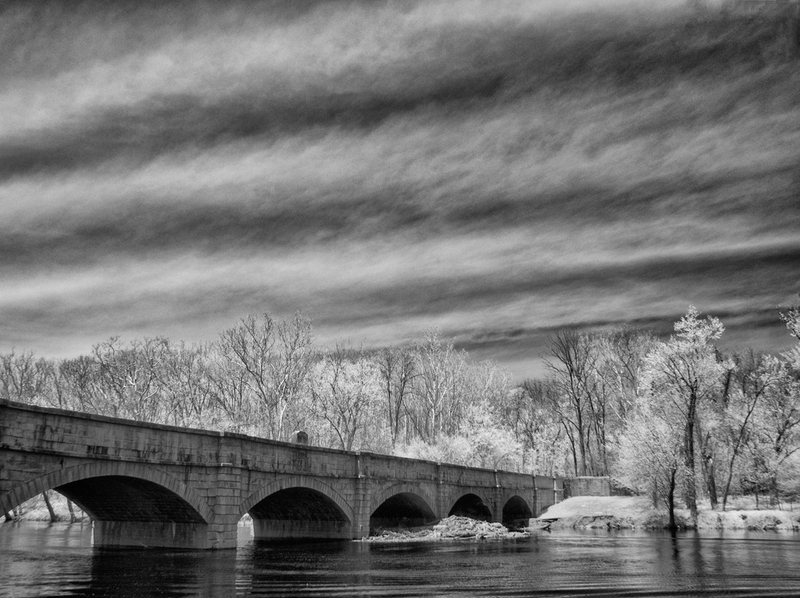 I find aqueducts, as well as bridges, railway bridges and covered bridges, difficult subjects to compose around. Their large, blockish, unchanging shapes seem to taunt me to find something interesting to do with them. And, given that the perspective is always from the riverbank – never from above, or below, or at right angles (assuming I can’t get out into the middle of the river), finding creative compositions becomes all but impossible. But, in visiting the same, unpromising subject time and time again, I have found that, while the subject itself may not change, the conditions surrounding it often do: the light, the sky, the clouds, the weather, the seasons. And this is what provides the basis for creating different looks to an otherwise unpromising composition. The lead image was shot this past Sunday, the second image last summer, both from pretty much the same spot. Another benefit I have found from facing down such challenges is that, simply by being out in the field with my camera, sometimes all I have to do to turn around and I am presented with promising subjects that I wasn’t even looking for. Among them, the trees in the third and fourth images. 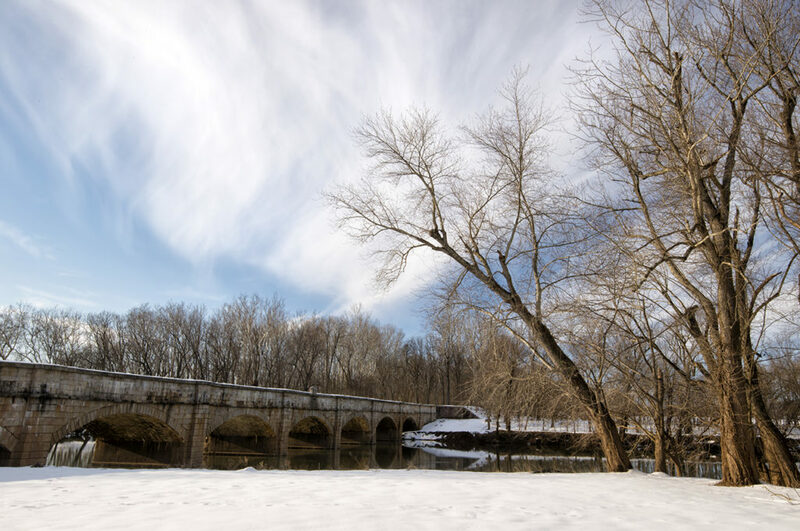 I would not have found these images had I not challenged myself to return to photograph the formidable Monocacy Aqueduct. Those of us who frequent social media sites, such as Facebook, have lots of “friends” who, in fact, are not friends at all. Indeed, they are not even acquaintances: they are strangers with whom we share our online existence and number among our virtual friends. And, yet, in the case of some of these imaginary friends, we interact with them every day, sometimes multiple times during the course of a day. That is more frequently than I interact with some members of my own family! Among photographers, we share our images with our virtual friends, praise each other’s achievements, track each other’s progress over time and occasionally – just occasionally – offer constructive criticism. Tracking a virtual friend’s photography through Facebook offers a unique insight into their life and how they see the world. It has been said that there are two subjects to every photograph: the one in front of the lens and the one behind it. Put another way, what we, as photographers, choose to shoot and how interpret it artistically reveals a lot about our perception of the world, about where we find beauty, about how we interpret our reality. By following a virtual friend’s photography regularly online over the course of a year or two, you can actually get to know them quite well, not just as photographers but even as people. I had this experience yesterday, when a Facebook friend of mine from Pennsylvania, Ray Snip, came down to the Washington area for the weekend and we went out shooting together. Ray and I have been supportive of each other’s photography on Facebook for more than a year. 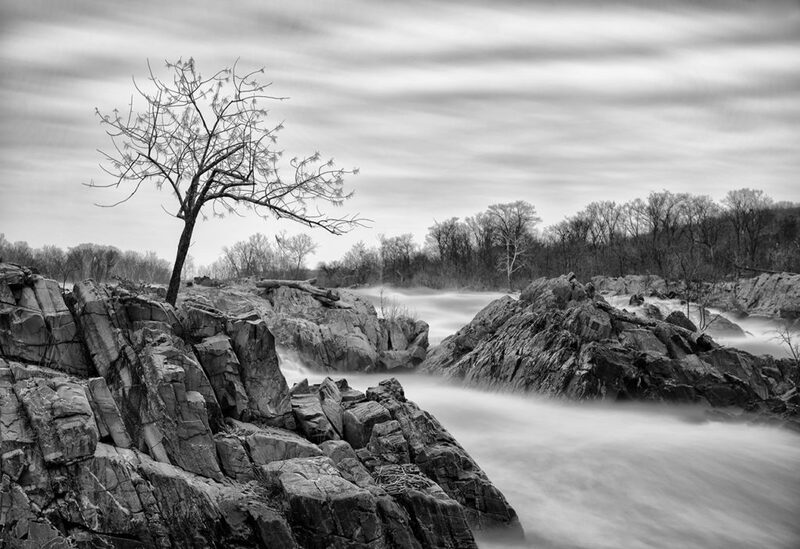 He has expressed particular admiration for a photo of mine of a lone tree that stands alongside the Potomac River at Great Falls on the Virginia side. And I had promised Ray that, if ever he came to Washington, I would take him to photograph “my” tree. 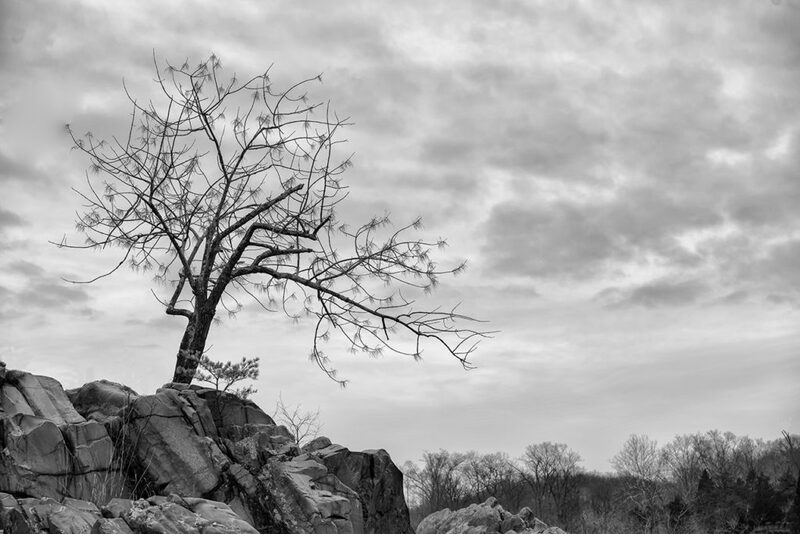 And so, at 7.00am yesterday, we met at Great Falls Park and set off to photograph the tree. Ray’s excitement at finally getting to see and photograph the famous tree was evident from the broad grin that never left his face the whole time we were shooting. For my part, I learned a great deal from seeing how Ray interpreted the scene. 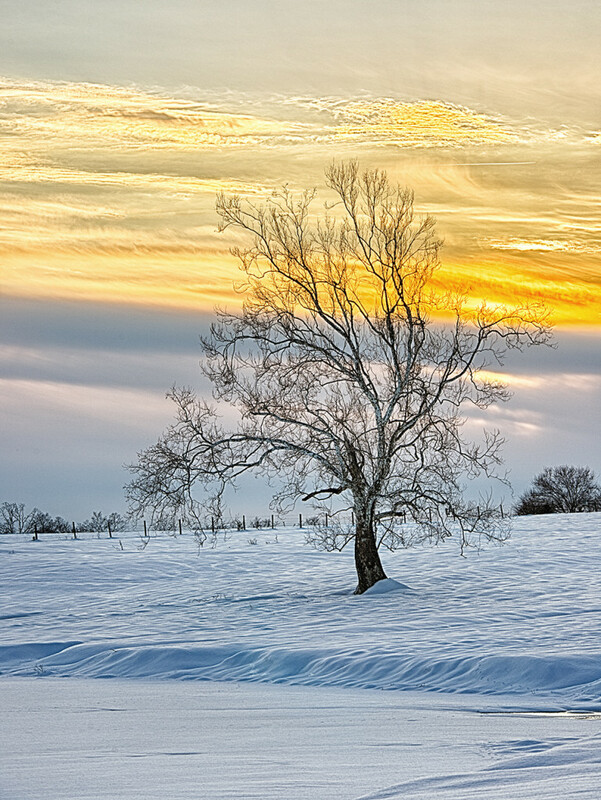 I thought I had exhausted every possible composition including this tree but, far from it, Ray immediately produced new compositions that had never occurred to me. Certainly, for one of his shots, he closely replicated the composition of my image that he admired – indeed, I encouraged Ray to do so and helped him get the composition exactly right – but Ray also took up new vantage points on the rock beneath the tree, used a different focal length lens or placed the tree in a different spot within the frame. As he showed me each of his compositions on his LCD screen, I became inspired by Ray’s fresh vision of this so-familiar subject and, in no time at all, I was replicating Ray’s compositions, rather than he mine. 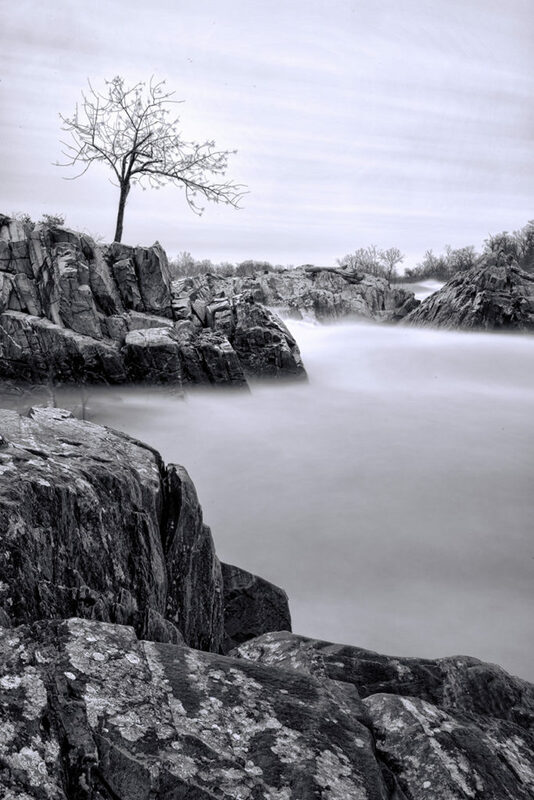 The images that I have posted on this blog represent my latest interpretations of the famous Great Falls lone tree, based on the inspiration I gained from meeting and shooting with my virtual – now real – friend, Ray Snip. Yesterday, I made the 335-mile roundtrip drive to photograph Swannanoa Palace, an Italianate mansion, in Lyndhurst, Virginia. 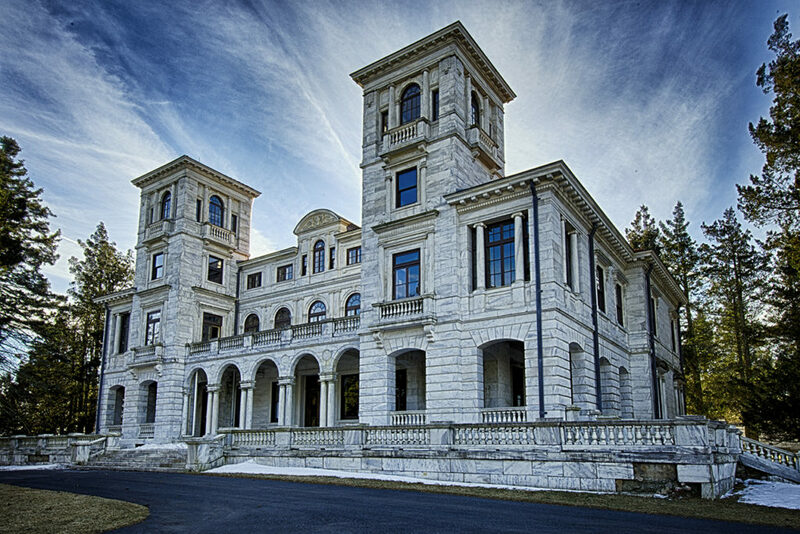 Modeled on Rome’s Villa Medici, Swannanoa was built in 1912 by James Henry Dooley (1841-1922), a Richmond-based, Irish-American lawyer, millionaire and philanthropist, as a summer retreat for himself and his wife, Sally May Dooley. Perched atop the highest point of the Blue Ridge Mountains, Swannanoa commands panoramic views over both the Shenandoah and Rockfish valleys. 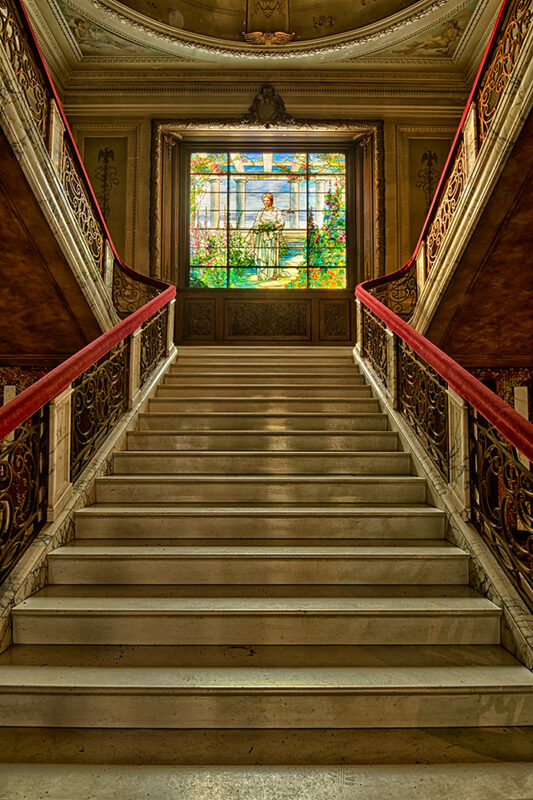 Intended as an expression of love from Dooley to his wife, the palace took 300 artisans eight years to build, was fitted out with Georgian marble, Tiffany windows and gold plumbing fixtures, and set in elaborate, terraced gardens. There is even a painting of the Taj Mahal, another famous architectural testament to love, built into one of the fireplaces. Sally May’s image appears in a 4,000-piece Tiffany stained glass window. From the top of an imposing staircase, her serene gaze watches over the grand entrance hallway. Despite the lavish expenditure necessary for its construction, Swannanoa was occupied for only a few years, as James died in 1922, at age 82, and Sally May shortly afterwards in 1926, at age 79. Since then, the property has passed through multiple hands and uses and has endured more than one period of idleness. 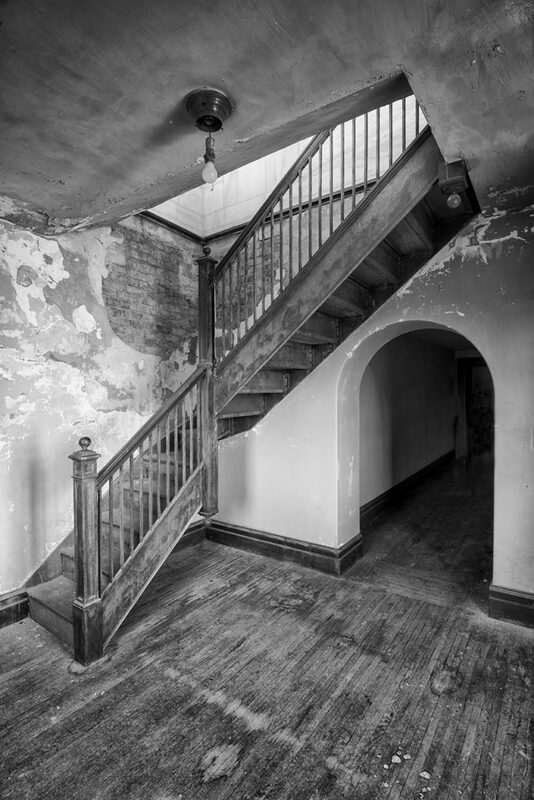 Today, Swannanoa stands empty and increasingly derelict, the prohibitive cost of its upkeep evidently beyond the pocket of its current owner. It is an interesting place for a photographer to visit, offering, as it does, a stark contrast between past splendour and present squalor, between the excess of yesteryear and the hardship of today.